Christian Zell, like C.C. Fleischer, worked in Hamburg. But Zell's instruments share much in common with those of the Berlin based Mietke, rather than being based on the Ruckers tradition as with Fleischer. 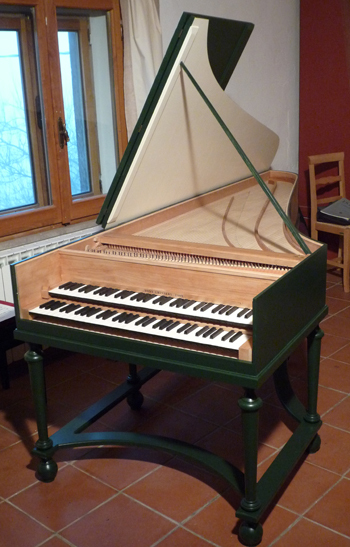 The scaling of Zell's double manual harpsichord is suitable for iron strings (except for the bass, which is always in brass). This longer scaling makes it possible to extend the treble range of the instrument, the 1728 goes up to d''', but a range up to f''' is possible. Like French instruments, the disposition of this instrument is 8'+4' on the lower manual, 8' on the upper, with keyboard coupler.